Although Bradley Cooper was in London for the premiere of The Hangover 3, according to these pictures of him with Michael Fassbender, this weekend could be called The Hug 3. 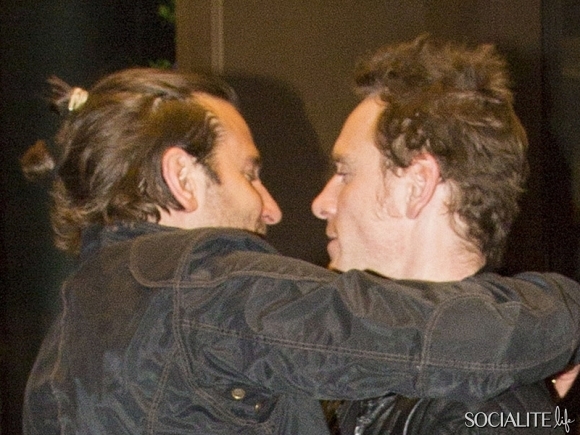 I think The Coop is a Fassinator, he's hugging Fassy JUST like how we would. You can't blame him can you? I love the hell out of these pictures. Forget McFassy, I never got on that train, but I'll take two scoops of Coopbender bromance anytime! We need to mail to Bradley a 'Keep Calm and Hug Fassbender' black v-neck! Who wants to chip in? Or you could call them Cooper Squared. Fassbender = Cooper in German, after all. Love this! Fassy & CO. I can't help wondering what Michael hold in his hand. Damn, I do root for McFassy but this is just too cute to pass !! Caption: "My, oh my, what big hugs you give!" How adorable, Besties! The British Olympian girl looks a little out of place until Bradley remembers she's there. You know the best part is that only True Fassinators would know what that means! :) Okay so Cu=Copper but it's close enough. Who's designing the t-shirt? I still love Michael and James so much though. Can't wait for 2014 when they go on promos for the movie. Thanks Barbara B. for finding the picture of Gleeson and Civil. (pinterest) I had read the article and went searching for the images of this and could not find anything. Thank Leah for this. :) This is a great picture. The whole thing is just so cute. And these two younger actors are class acts.